The main goal of OpenScienceLink is to introduce and pilot a holistic approach to the publication, sharing, linking, review and evaluation of research results (including articles and data journals), based on the open access to scientific information. The project’s holistic approach will empower a novel eco-system for open access to scientific information, which will provide a range of added-value services for all stakeholders. These added-value services will be empowered by leading edge ICT infrastructures, notably infrastructures based on semantic search, data mining and social networking technologies. In particular, the project will adapt and integrate leading edge semantic search and social networking infrastructures, which will be accordingly used to pilot added-value applications and services for open access to scientific information. These added value services will alleviate the fragmentation of existing approaches, while also remedy issues associated with the lack of structured data journals and associated data models, the weaknesses of review processes, the poor linking of scientific information, as well as with the limitations of research evaluation metrics and indicators. Based on the pilot operation and the relevant evaluation of its services, OpenScienceLink will manifest the business potential of open access paradigms. This will be facilitated by the fact that the pilot operations will involve multiple stakeholders in the value chain of publication and use of scientific results. As part of its holistic approach, OpenScienceLink will also devise and validate a legal framework for regulating and reusing open scientific data, while at the same time facilitating IPR management. The OpenScienceLink approach will be empowered by a novel ICT platform, which will provide capabilities for accessing a multitude of openly accessible data sources, while at the same empowering their semantic linking and data processing. This platform will also offer a wide range of opportunities for better collaboration between researchers, scholars, research organizations, including their ability to formulate added-value scientific / research networks. The OpenScienceLink ICT (web-based) platform will be integrated on the basis of readily available results of the project partners, notably R&D results from FP7 ICT projects on semantic search, data mining and social networking infrastructures. Specifically, results from the FP7 projects PONTE and SocIoS will be exploited, along with the GoPubMed semantic search engine. These results will be customized and adapted in order to serve the project’s goals and enable the added-value services for research organizations, funding authorities, individual researchers/scholars, publishers and other stakeholders. Note that the use of semantic and social networking technologies will be a cornerstone for the project’s platform and approach, given that they will be the main building blocks that will empower the core innovations associated with the OpenScienceLink platform and services. Creation, establishment, maintenance and evaluation of open data journals comprising scientific datasets, experimental datasets and simulation data that underpin research results. OpenScienceLink will provide tools and techniques for managing the full lifecycle of data journals. Semantic linking of the data sets with relevant research articles and monographs, in order to facilitate benchmarking and validation of research results, as well as comparison of similar works that leverage the same data sets. The solution will provide tools for benchmarking and certification of research results on the basis of open access to data journals. Publishing and sharing of publications and experimental datasets, as well as their linking with researchers and scholars, but also with other articles and datasets. Tools and techniques for structured sharing and exchange of experiences across all the stakeholders of the open access paradigm and associated value chains (including publishers, researchers, and scholars). The OpenScienceLink will enable the formation of scientific communities working on the same or pertinent research areas, thereby facilitating the creation and evaluation of scientific groups and clusters of scientists. Novel paradigms for reviewing articles, along with associated tools facilitating editors to find competent reviewers, and referees to gain instant access to all supporting information (such as relevant research articles and datasets). Introduction and management of new metrics of scientific performance for individual scholars, but also groups, clusters and communities of scholars. The metrics will be able to capture and quantify trends and dynamics, which current metrics cannot quantify. OpenScienceLink will enable the calculation and expressive visualization of such metrics for various stakeholders in order to facilitate processes such as tenure programs, research sponsorships and allocation of grants. These functionalities will be offered in the form of a set of novel integrated pilot services, which are described in the following paragraph. These pilot services will be piloted, validated and evaluation of a period of over eighteen months. The relevant evaluation processes will facilitate the improvement of the OpenScienceLink platform and services, while also boosting the sustainability and business plans of the project. OpenScienceLink intends to investigate novel business models associated with open access. These business models will consider the benefits of the open access model for several stakeholders, which are represented within the OpenScienceLink consortium, including both publishers and research organizations. Along with the evaluation of the project’s results, OpenScienceLink will attempt to elicit best practices associated with the establishment and use of openly accessible repositories of scientific information. On the basis of these best practices, the project will endeavor to contribute to policy developments associated with the topical subjects of open access to scientific information. Policy-related contributions will be provided in the form of policy development guidelines, which will be actively disseminated at both national and EU level. 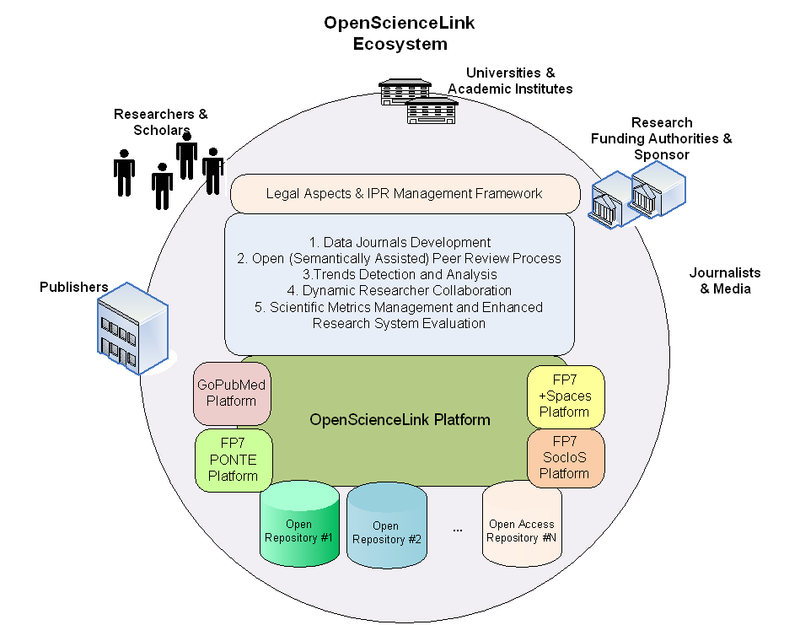 The figure provides an overview of the OpenScienceLink eco-system, which will be empowered by the OpenScienceLink ICT platform. Note that a variety of elementary ICT services will be implemented as part of the OpenScienceLink platform, in order to enable the deployment and integration of the five pilot services.